MassBio was cancelled on Feb. 8th due to the snowstorm. It has been rescheduled to Feb. 24th. MassBio represents over 670 companies, both biotech/pharma and life science service providers, and its goal is to advance the life science industry by providing great resources to its members and by being an advocate for the industry. 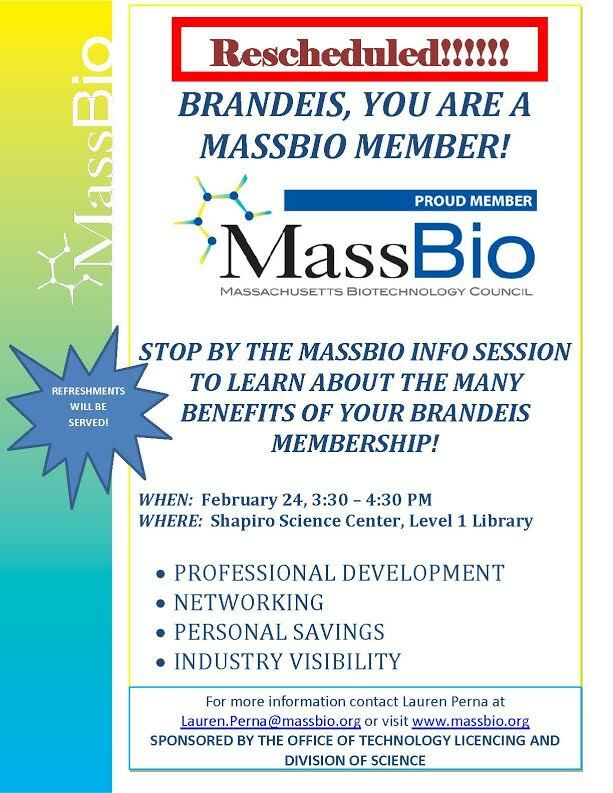 Brandeis is a member of MassBio and as such members can benefit from great savings on the lab and office supplies. In addition, member companies have access to FREE visibility opportunities with MassBio’s website and social media platforms. However, there are many additional benefits that Brandeis students and faculty can take full advantage of as individuals. We have access to FREE networking and professional development opportunities through their regularly scheduled Forums and Mixers. Members also receive individual discounts on local businesses and restaurants through their Employee Perks Program. And, each person at Brandeis can sign up for their own Member Portal Account to access great resources such as live-streamed Forums, archives of recorded Forums and a Knowledge Base of white papers. Susan Band Horwitz, Ph.D., will receive the Eighth AACR Award for Lifetime Achievement in Cancer Research. Horwitz is being recognized for pioneering research in the mechanism of the anticancer drug Taxol and for contributions to the understanding of how this microtubule-stabilizing drug arrests cell division, which eventually leads to cell death, especially of cancer cells. Once at Brandeis, Horwitz worked with Nathan Kaplan, chairman of the newly formed Biochemistry Department. Her Ph.D. dissertation (1963) involved bacterial metabolism of sugar alcohols. While juggling raising children and doing part-time postdoctoral research (some things haven’t changed so much over the years! ), Horwitz became interested in pharmacology and anticancer agents. She joined the faculty at Albert Einstein College of Medicine in 1970, where she has remained since, currently serving as the Rose C. Falkenstein Professor of Cancer Research and co-chair of the department of molecular pharmacology. Horwitz’s academic career has been vastly productive, in terms of research, publications and awards, but perhaps more significantly in terms of her research’s impact on millions of cancer patients worldwide. Her current research focuses on new natural products with similar mechanism to Taxol, looking for ways to enhance therapeutic value and to avoid drug resistance. The AACR Award for Lifetime Achievement in Cancer Research was established in 2004 to honor an individual who has made significant fundamental contributions to cancer research, either through a single scientific discovery or a body of work. These contributions, whether they have been in research, leadership or mentorship, must have had a lasting impact on the cancer field and must have demonstrated a lifetime commitment to progress against cancer. Horwitz will receive the award at the Opening Ceremony of the AACR 102nd Annual Meeting. Angela Brodie, Ph.D. from the University of Maryland Greenebaum Cancer Center will receive the 2010 Jacob Heskel Gabbay Award in Biotechnology and Medicine. The award, administered by the Rosenstiel Center at Brandeis, consists of a $15,000 cash prize and a medallion. Dr. Brodie will deliver the award lecture, Aromatase Inhibitors and Breast Cancer: Concept to Clinic, on October 12, 2010 at 4:00 pm in Gerstenzang 121. Dr. Brodie pioneered the development of aromatase inhibitors, a new class of drugs widely used today to treat breast cancer. Aromatase is the key enzyme in estrogen biosynthesis. Aromatase inhibitors reduce the level of estrogen produced by the body that fuels the growth of breast cancer cells. Although tamoxifen is effective in treating breast cancer, the antiestrogen is a partial agonist as well as an antagonist and may not be optimally effective against breast cancer. By using a different approach, Dr. Brodie reasoned that compounds that inhibit the production of estrogen without having significant estrogenic activity themselves might be more effective in treating breast cancer. Dr. Brodie began developing aromatase inhibitors with her husband Harry Brodie in the early 1970s. She showed that the most potent inhibitor identified, 4-hydroxyandrostenedione (4-OHA) was effective in suppressing estrogen levels and causing regression of mammary tumors in animal models. Subsequently, she collaborated with the Royal Marsden Hospital in London to evaluate 4-OHA in breast cancer patients. The researchers found that the aromatase inhibitor not only suppressed serum estrogen concentrations, but also reduced tumors in postmenopausal patients with advanced breast cancer who had relapsed from tamoxifen or other treatments. This first selective aromatase inhibitor came into worldwide use in the early 1990s from Novartis. Dr. Brodie’s pioneering studies paved the way for three other FDA approved aromatase inhibitors. Dr. Brodie is currently investigating new strategies for treating hormone resistant breast cancer based on understanding the molecular mechanisms involved. Dr. Brodie is also investigating androgen synthesis inhibitors to treat prostate cancer. A novel compound developed by her group has recently started clinical trials.